English: Southern carmine bee-eater: French: Guêpier carmin; German: Karminspint; Spanish: Abejaruco Carmesí. 9.5-10.5 in (24-27 cm), excluding tail streamers of up to 4.75 in (12 cm); 1.2-2.1 oz (34-59 g). Upperparts are predominantly carmine with contrasting beryl-green crown, chin, cheeks, and rump. Black mask. Throat is olive-green but appears azure to greenish blue against the light. Belly is carmine shading to azure on undertail-coverts. the continent to Uganda, Kenya, and Tanzania. In the south, they occur from the Okavango headwaters in Angola east to Mozambique, south into northern Botswana and southern Zimbabwe. 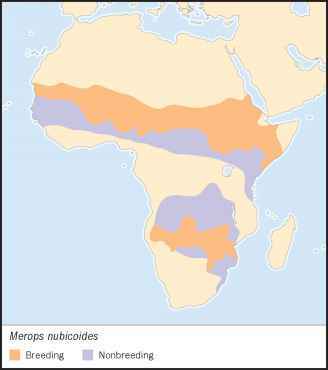 Non-breeding birds spread into northeast South Africa and the Transvaal and north into Angola, southern Zaire, Burundi, and west Tanzania. Savannas, open woodlands, lakeshores, and mangroves in coastal regions. Has three-stage migration pattern in northern and southern tropics. In the southern tropics, from breeding grounds, travels south from December onward, and back north in March to August, until breeding season. 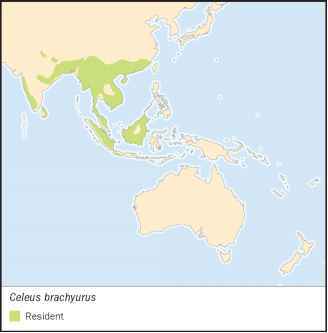 In the northern tropics, the birds move north following breeding. Nearly all food is taken in continuous flight. The bird is common at bush fires, where it swoops above the leading edge to capture fleeing insects. In northeastern savannas, it sometimes associates with large ungulates and large cursorial birds (e.g., ostrich, bustards), using their backs as a perch from which to sally after insects disturbed by grazing animals. Large breeding colonies of 100-1,000 nests are common. Nests occur in cliffs or on flat ground, where colonies are often larger—2,000-3,000 nests. North of the equator, egg-laying occurs from February to May (later farther north), and in the southern tropics from September to November. Cooperative breeding has not been confirmed, although casual observations suggest it is likely.